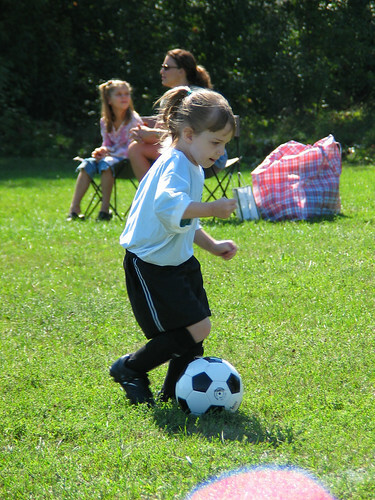 Saturday morning, Megan had her first soccer game at Tarkington School. Her team, made up of four other girls, choose the name PowerPuff Girls. They had had only one practice before this game, but they looked very good. Megan looked like she knew exactly what to do, most of the time, and even scored a goal for her team. She looked like she had a lot of fun. Hot. I scored a goal. I ran a lot and I was thirsty and hungry. After the game I had cookies, fruit roll-ups, and a drink for my treat.